In today’s rapidly expanding business landscape, HR directors have somewhat been forced to become a “Jack of all trades”. With an increased emphasis on having a thorough sense of the strategic corporate direction and a large need to be able to influence key policies/decisions, being an HR director comes with many challenges. A while back, many HR Directors’ main concerns and tasks included worrying about attracting the right talent, retention rates and ensuring that all business documentation is relevant, accurate and up to date. However, as time has progressed, many other areas have also come into their scope of responsibilities such as engagement, cost saving, performance improvements and much more. With all the increasing demands, it can be hard to confine the responsibilities within this role to just one individual. Therefore, your business technology needs to be performing optimally to support you, and others, in all areas. An increase in staff engagement within the business is a surefire way to improve your organisation’s productivity, and an intranet can be a great way to see this spike in engagement. By using the tools your intranet provides, you can take measures that will lead to increased productivity. 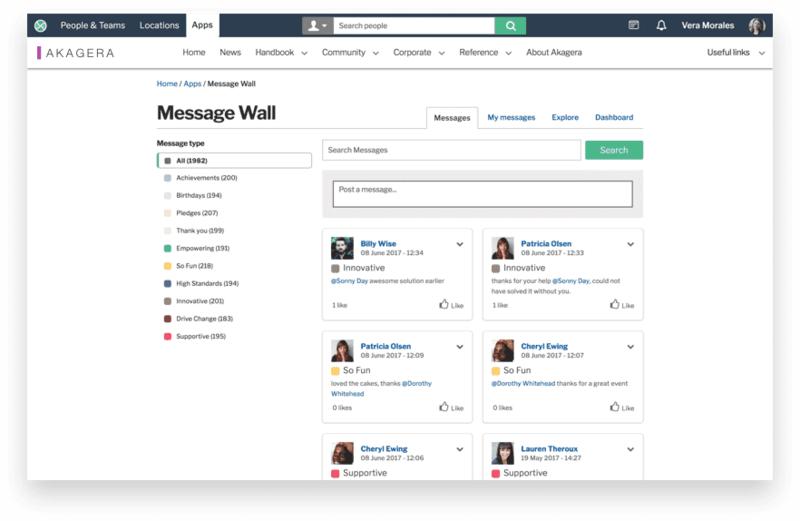 Your intranet can allow you to engage your staff on a personal level, by customising and targeting the content that they see and the channels and applications through which they interact with each other. Intranets can also offer you ways to quantify this engagement through analytics in a way which would not have been possible only 20 years ago. It’s a proven fact that staff who feel valued by their organisation are happier in their jobs, and therefore less likely to look for a position elsewhere. Invotra provides you with a platform to give everyone in your organisation a voice, where you can poll your staff’s opinions, or simply provide channels for everyday communications, making people feel engaged and therefore valued. We provide social applications such as Invotra Message Wall, which allows users to quickly and easily share a ‘congratulations’ or a ‘happy birthday’, for example. 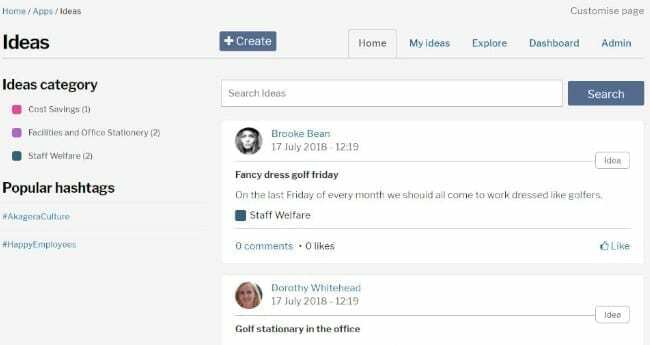 We also have the Invotra Ideas application, giving all of your users a voice and the opportunity to put forward their thoughts. Data is a buzzword for everybody nowadays and it’s easy to see why when you look at the benefits accurate and in-depth business intelligence can have for your organisation. 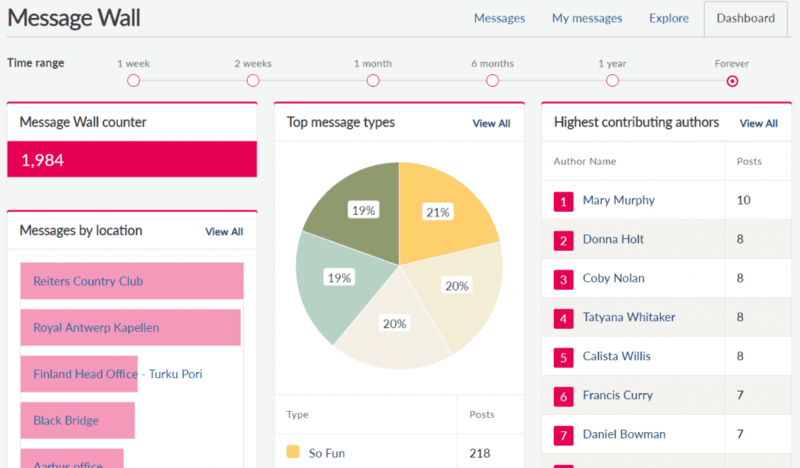 Invotra hands you the tools to definitively measure your organisation’s engagement within the intranet. We provide intuitive dashboards on all of our applications that give you various kinds of analytical feedback. 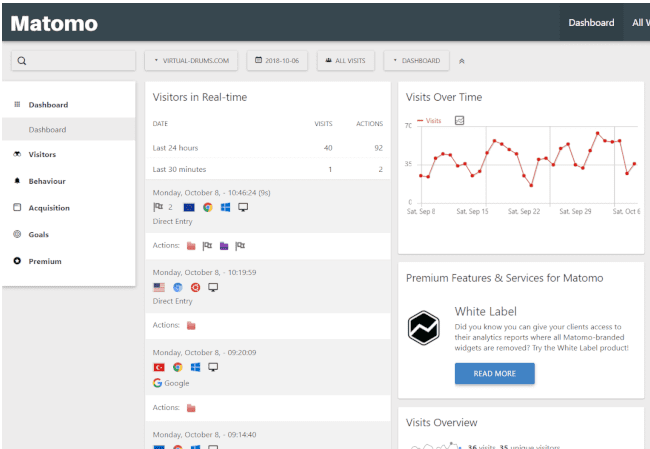 We also connect with Matomo to provide you with a different kind of analytics to our dashboards, such as the number of actions taken or the time spent on a page. It goes without saying that one thing a HR Director will work closely with is people. Here at Invotra, we understand the importance of having a well-organised, controllable social-directory of people within an organisation. Invotra People consists of several taxonomies, people, teams and locations. Each of these separate taxonomies serves to create a highly customisable, scalable service and can all be used to make your searches more specific and tailor the information that is presented to whatever your needs at the time may be. We also understand the confusion that can be caused with regards to hierarchy and structure within organisations, particularly the larger ones. This is where our “Org Chart” feature is extremely useful. With this tool, you can create a detailed, organised flowchart, depicting the workflow and hierarchy within your company. Invotra also has a Team Chart available to break things down in a different way. Pushing a positive user experience becomes much much easier with Invotra. 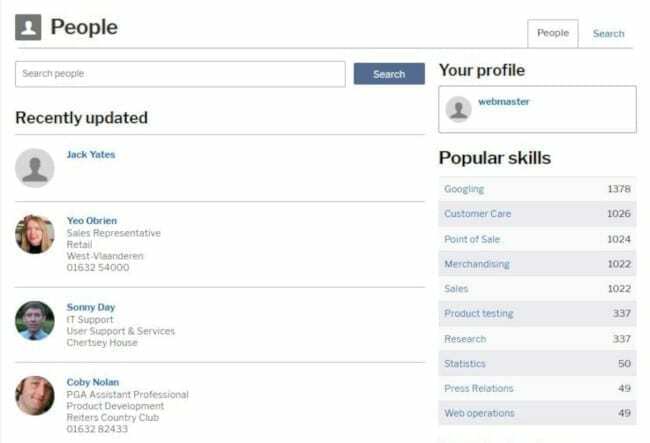 Our content management, social applications, search features and analytics can make your role as a HR Director a more positive and easier-to-manage experience. Here at Invotra, we believe that the social features our product offers put us in a league of our own, and our customers agree. One such customer received over 2500 comments on one single post, and this huge engagement from the workforce drove change within the decisions of upper management. So, contact us today and see just how much Invotra can benefit your organisation.